The Marigold Industrial Emperor ME107 Chemical-Resistant Gauntlet Gloves are gauntlet-style natural rubber latex gloves designed to provide durable and reliable protection against chemicals. 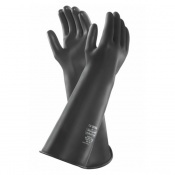 Offering good resistance to water-based chemicals, these extra-long gauntlets are ideal for a wide range of applications, primarily in the agriculture, construction and janitorial services industries. At a length of 610mm, the ME107 Gloves provide protection to the wrist and entire forearm, protecting the skin from liquid and chemical splash-back. This makes them ideal for tasks involving chemicals and waste, such as cleaning and chemical processing. The Emperor ME107 Gauntlet Gloves are available in a choice of sizes, making them suitable for most users. Please consult the table below for details, then select the required size from the drop-down menu at the top of the page. These gauntlet gloves have a thickness of 1.2mm and a length of 610mm. My husband uses these and would not be without them for particular jobs - long may they continue. They are hard wearing and last very well.